Steady growth in the consumption of pre-cooked food suitable for microwaving strongly motivated the creation of Ecovent packaging by Südpack. Although microwaves offer the undeniable advantage of practicality, they do not guarantee optimal cooking of the food: the product generally ends up undercooked in parts and overcooked in others. Other food, too, like bread and pizza, loses its characteristic aroma once cooked or warmed up. Südpack’s R&D developed then a series of specific containers to solve these problems. Ecovent, in particular, has been created for bread based products. Ecovent is a primary packaging system, created in accordance with the characteristics of the product contents. In fact, depending upon the food, the outer wrapping can consist of flow wrap film (OPA+PE / PET+PE / OPP+PE), a PP based rigid film or MAP top web. 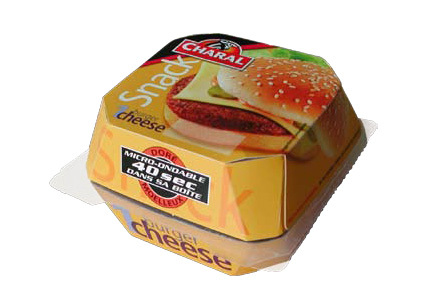 It stands out, however, for the special metalized carton strip inserted in the pack that, as well as optizing wave refraction, favours homogenous cooking of the product and reduces oven cooking times. The process also confers that totally indispensable aroma and crispiness to bread based products.